Saas-Fee is a car-free village and can be easily accessed by the frequent “post buses” from Visp and Brig. 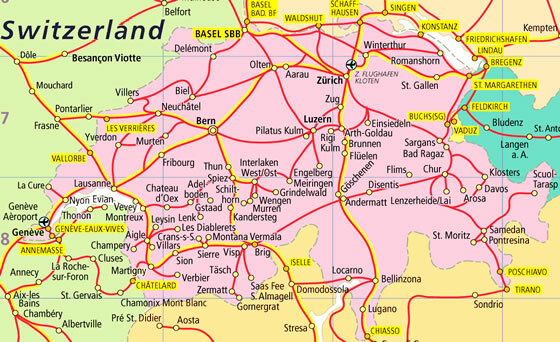 These towns are well-connected to many European hubs via the excellent Swiss rail network. You can take the direct train from Geneva, Berne, Basel, Zurich, Montreaux, Lausanne, Milan and Paris. You can even catch your train from the railway stations inside Geneva and Zurich Airports – see the following map. To make life easier for skiers and other travellers with luggage, the Swiss train company provides a luggage forwarding service from Zurich, Geneva or Bern Airports to Visp and Brig rail station. Find out more about the SBB Fly Rail Baggage service. You can plan your trip and buy your ticket online on the Swiss Travel System website, which offers a range of discounted passes and transfer tickets which include mountain railways and post buses. It’s so easy to get to Saas-Fee and enjoy a wonderful vacation at the resort’s best Chalet Alpenhof luxury apartment. Book with us today – we look forward to hosting you!